Home Awards and Events Trends That Fuel The Future Of The Industry. 21st celebrations were the order of the day at The International Food & Drink Event (IFE) today, as the UK’s largest food & drink industry event officially marked it’s milestone edition. Welcoming 1,350 exhibitors, it provides an unparalleled opportunity for suppliers & buyers to network, find new products and ideas, and be informed and inspired. 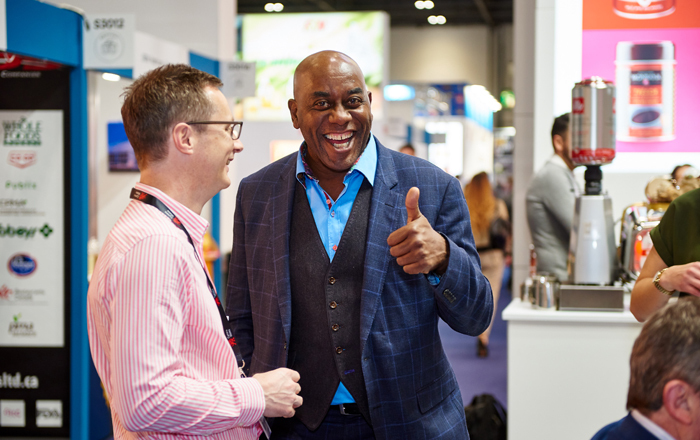 Celebrity chef Ainsley Harriott even made a guest appearance, stopping by to share his great range of couscous and cup soups, new to the Euro Food Brands portfolio. • Best Plant-based Product: Food for Progress – Pulled Oumph! • Best Street Food Brand: Food for Progress – Pulled Oumph! Highlighting how trends evolve into lifestyles, the rise of plant-based eating was the hot topic at the Talking Trends stage as Ella Mills of Deliciously Ella fame, joined representatives from The Vegan Society, Planet Organic, Speciality Food magazine, Stem & Glory and Wicked Kitchen / Wicked Health to discuss how this meat-free movement is shaping the future of the industry. Eating with Your Eyes – How to Appeal to the Instagram Obsessed also proved a crowd draw. Hosted by Cat Jennings, Director of Foodservice & Hospitality at Speed Communications, the session gave useful advice on how the industry can keep up with the ever evolving and changing landscape of social media. Meanwhile, The Big Debate at The Hub had a strong export & import focus with discussions covering everything from opportunities in China to the impact of Brexit. Buyers & suppliers heard advice on regulatory issues, market insights and valuable dos and don’ts from the British Embassy, Beijing and the China Britain Business Council, the Food & Drink Exporters Association, the Food & Drink Federation, Cotswold Fayre and AHDB. At the Tasting Trends showcase, Qwrkee showed off their new-to-market pea milk; Lauren Lovatt and HEAL Eats cooked up pancakes while discussing the benefits of CBD oil, and Stina Eriksson of FRILL Frozen Smoothies extoled the virtues of these gluten, dairy and sugar-free treats.